Austrian based Cretacolor offer an excellent range of high quality pencils, pastels, leads, artists powders and accessories. The products reflect the expertise gathered over years of experience and score with high colour intensity, rich colour laydown and superior lightfastness. Among their many pencil Cretacolor offer one of the nicest pastel pencil ranges around. With 72 beautiful colours and an especially soft, blendable core they are a favourite among pastel artists. We also have the newer Karmina and Marino ranges as well as the excellent graphite ranges Cleos and Monolith. Precise and exact - Cretacolor Pastel Pencils come in 72 colours which can be smudged and mixed together to create a huge range of tints and the pencils can be sharpened to a point for more detailed work. Beautiful, smooth, soft pastel pencils! 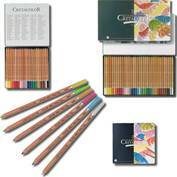 Cretacolor offer a really interesting range of sketching pencils. With oil based and dry pencils in blacks, whites, sanguines and sepias, there is everything here any sketcher or portraiturist could need. The Cretacolor Cleos Graphite Pencil is great for all types of art and design. This fantastic graphite pencil comes in 20 degrees to allow for a wide variety of light and shade in your sketching. The Cretacolor Karmina Pencils are a range of water resistant pencils in intense and vibrant colours with a soft rich stroke. These pencils can be mixed by layering over different colours. Cretacolor Marino Watercolour Pencils are fine art quality pencils in brilliant colours with a soft core giving a rich stroke. Colours can be mixed with one another by adding water to achieve smooth contours and colour transitions. Cretacolor 5.6mm Leads are a range solid leads which used with a holder are ideal for sketching and drawing. Cretacolor leads are available in oil based and non oil based and in various degress of traditional sketching colours such as sanguine and sepia as well as graphite. 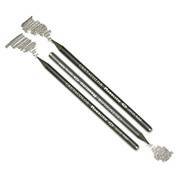 We also have the popular lead holders and lead sharpening boards. These unburnt, square shaped hard pastels from Cretacolor guarantee brilliant colours due to their high pigmentation and exceptional lightfastness. They produce a velvety, oil free stroke. Cretacolor Artists' Powders are especially suitable for large surface drawing and 3-dimensional work. They can be mixed with water or a binding agent and come in Sanguine, Sepia, Charcoal and Graphite. Cretacolor offer a nice range of accessroies to complement any artists' pencil collection. We have selected some of our very favourites such as the metal caps to protect the end of your pencil and the ever popular Cretacolor Monolith Pencil holder, a sleek and elegant looking pencil extender, among others.